Productora y Comercializadora de Televisión (PCTV), Latin America's largest television programming distributor, will distribute its TV channels to cable networks in Central and South America via SES’s key orbital position at 47.5 degrees East. Satellite operator SES has confirmed that its SES-12 platform was successfully launched onboard a flight-proven SpaceX Falcon 9 rocket from Cape Canaveral. 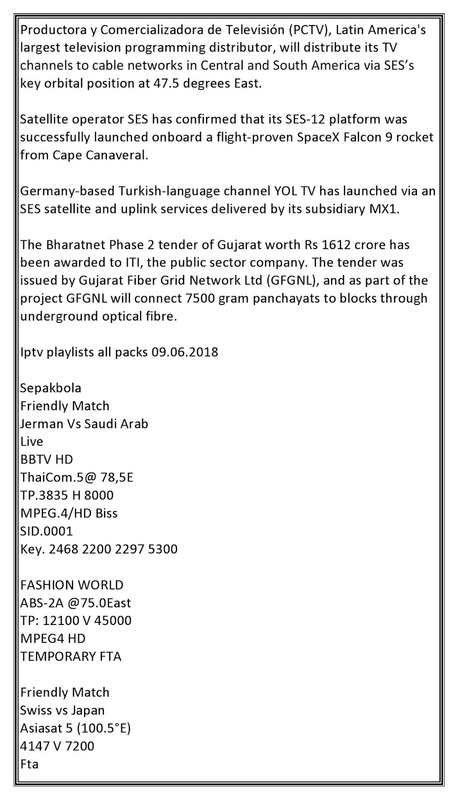 Germany-based Turkish-language channel YOL TV has launched via an SES satellite and uplink services delivered by its subsidiary MX1. The Bharatnet Phase 2 tender of Gujarat worth Rs 1612 crore has been awarded to ITI, the public sector company. The tender was issued by Gujarat Fiber Grid Network Ltd (GFGNL), and as part of the project GFGNL will connect 7500 gram panchayats to blocks through underground optical fibre.